The Zebra TTPM3 has been discontinued. No direct replacement is available. 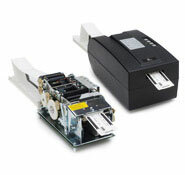 The uniquely flexible Zebra TTPM3 ticket printer prints ISO credit-card-sized tickets - such as public transport and event tickets - with text, graphics and barcodes on one side, while it encodes and verifies data on up to three magnetic stripes simultaneously on the reverse side. It verifies each and every ticket to ensure 100 percent validity, and can continuously print without downtime. The TTPM3 issues tickets in 1.9 seconds per ticket when set in standard mode. This print speed is cut in half to 1 second per ticket when set in "peak-hour" mode. The TTPM3 is available as a freestanding desktop printer or as a unit for embedding in kiosks and terminals. Options include front loading of tickets, reject function for tickets that cannot be encoded, retract for untaken tickets, and Ethernet connectivity.